According to my calendar, we’re already partway into August. Can you believe it? I sure can’t. Thankfully, as fast as the summer seems to be flying by, it’s already been full of fun adventures, good times with friends, and lots of delicious food, so I can’t really complain. I’ve also been working on a few projects, which means there’s also been lots of baking and cooking and writing up a storm behind the scenes. I’ll be sharing all of those projects with you over the next little while, but in the meantime, it’s time for some Secret Recipe Club fun, in the form of a ridiculous easy Peach Rhubarb Cake. This month, my assignment is Italian in the Midwest, which is written by Pola. 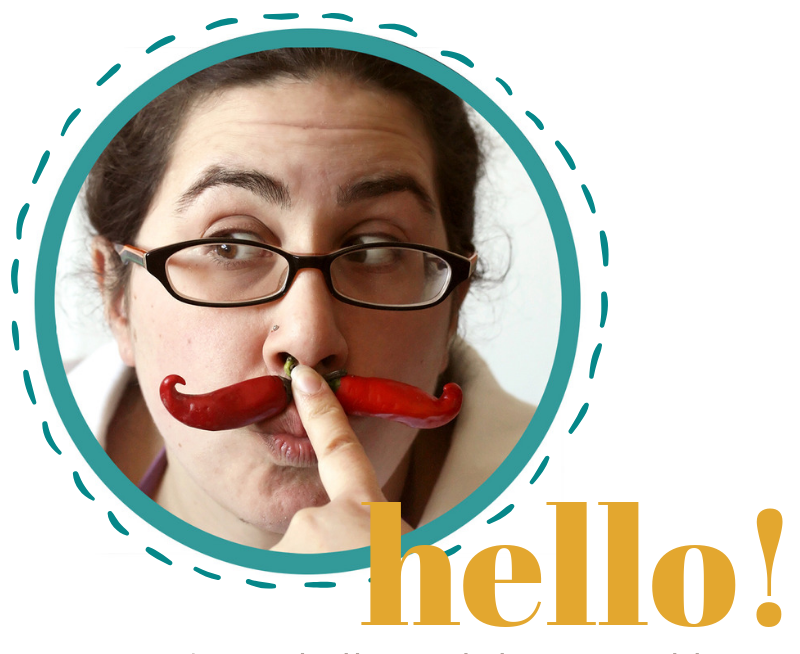 She describes her blog as an effort to bring authentic Italian dishes to the American midwest, which is something she’s certainly qualified to do, considering she’s an honest-to-goodness Italian gal. 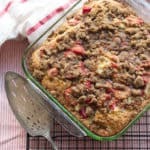 Initially, I had planned on making one of Pola’s many amazing classic Italian dishes, but as soon as I spotted Pola’s recipe for Rhubarb Cake, that plan flew right out the window. For one, I was craving a simple summery dessert, and two, I had all of the ingredients I needed on hand… right down to a container of Greek yogurt in that awkward stage between big-enough-to-eat and small-enough-to-toss-without-guilt. See? It’s like Pola knew I’d be in this position, and created a cake just for me. It’s a perfect dessert for those perfect summer days, when the sun is shining and the breeze is blowing, and you simply can’t bear to be indoors any longer than absolutely necessary. I started off following Pola’s recipe pretty closely, though I couldn’t help but tossing in a little vanilla extract and salt for flavour. 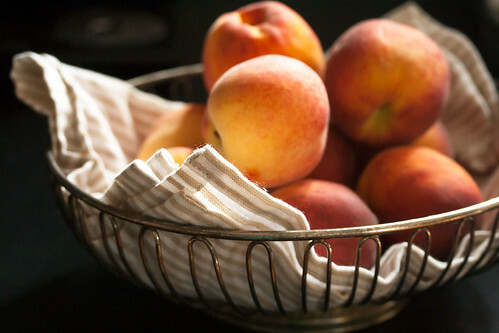 But when the time came to add the fruit, I couldn’t help myself… I’d just bought a big basket of fresh Ontario peaches, so perfectly suited for this recipe that they practically jumped into the batter on their own. 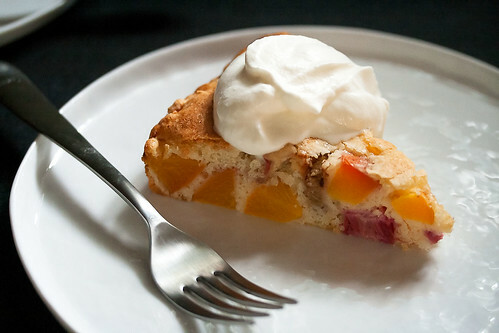 Not being one to stand between a fruit and its destiny, I decided to substitute roughly chopped peaches for half of the rhubarb in Pola’s original cake. 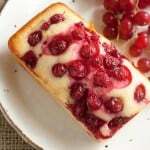 That’s the beauty of this kind of cake, you see… it can easily be adapted with whatever fruit you happen to have on hand. No rhubarb? No problem! Almost any summer fruit will do just as well – blueberries, strawberries, apricots or plums would all be perfect choices. 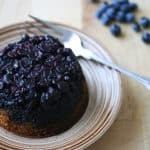 This easy cake lends itself well to just about any combination of summer fruits - here, I've used sweet peaches and tangy rhubarb, but feel free to change it up with blueberries, strawberries, apricots or any other soft fruit. Preheat the oven to 375F. Line a lightly greased 8" round cake tin with parchment. In a large mixing bowl, beat the eggs and sugar until pale yellow and doubled in volume. Stir in the yogurt and vanilla extract. In a second bowl, combine flour, baking powder and salt, and beat into the egg mixture. 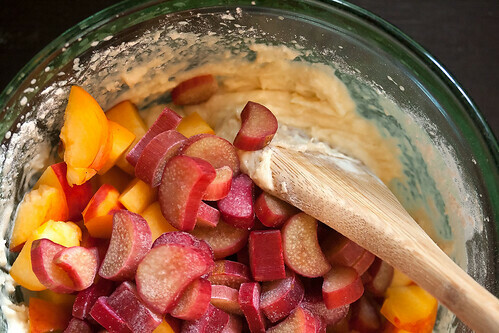 Fold in the peaches and rhubarb, and scrape into the prepared pan. Bake in preheated oven for 40 minutes, or until the top is golden brown and a toothpick inserted into the centre comes out with a moist crumb. Let cool on a wire rack for at least half an hour before serving. Made this cake for family. Used half the sugar and topped with whipped cream. It was delicious! If I doubled the recipe and put it in a 9×13, how long should I bake it for? I haven’t tested it as a 9×13, so I can’t say for sure. However, since a double recipe in a 9×13 will be roughly the same thickness as the original, I’d say the baking time should be more or less the same… I’d start off by checking after the regular baking time (40 minutes) to see how it’s doing, and then go in 5-minute increments until a toothpick inserted in the middle comes out with just a few crumbs. Hope that helps! This is very tasty, moist cake. I doubled the recipe and cut the sugar by 1/3 and it still turned out beautifully. Served it with peach jam (yes, I’m working my way through a huge box) and Greek yogurt for a guilty breakfast. Delish! So glad you enjoyed this cake, Ella! That is one stunning fresh fruit cake. Love it, love it, absolutely love it! Rhubarb and peaches? I’ve never tried them together, but now I’m going to have to. This cake looks so good. Secret Recipe Club looks so fun! :) And this cake looks aaaamazing! I feel the same way about August. In just a few weeks, we’ll be baking with apples and pumpkins. 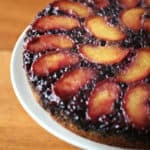 I’m hoping to get a few more peach recipes made in the meantime, and this cake is right up there on my list. The photos are gorgeous! Goooooorgeous!! Oh my goodness, I love this cake. 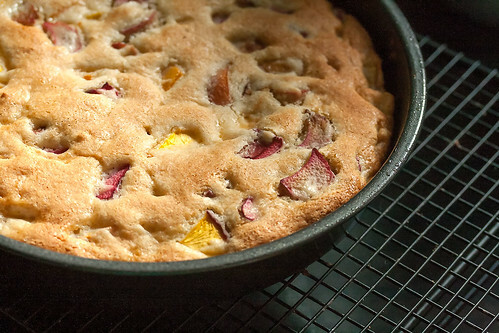 It sounds so versatile but I love the combination of peaches and rhubarb together. This is beautiful and now I want a taste. Definitely making this one! you don’t normally see rhubarb cheating on strawberries with peaches, but this sounds like a great match! I know what you mean, Robyn – rhubarb and strawberries go so well together, it’s almost impossible to imagine rhubarb hanging out with anyone else. It’s a surprisingly good pairing, though! 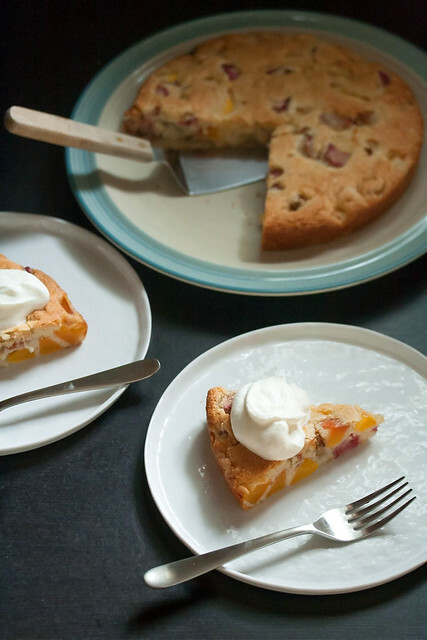 Love love love peaches and can’t wait to give this cake a try – looks delicious! Looks stunning and gorgeous pictures. Your cake looks absolutely bejeweled. Gorgeous!